The dead Shakespeare Garden on Graham Kirkwood’s ancestral English estate may well be cursed, and a preternaturally gifted gardener from New England could be his last hope. Herrick (The Sparrow Sisters, 2015) returns to tell a second tale about the Sparrow Sisters and their magical gardens. Able to nurture any plant to flourishing beauty, as well as to heal any ache through their skilled tinctures, the sisters are the empathetic healers of Granite Point on the New England coast. Sorrel, the eldest sister, is still reeling from the tribulations of last summer, when her sister Patience was accused of causing the death of a young boy. The townspeople turned against the sisters, wrecking their nursery and sowing hate. Patience may have been acquitted and the town may have once again embraced its quirky hedgewitches and apothecaries, but Sorrel remains angry. The invitation to heal the ruined Kirkwood garden comes at a most opportune time. Once in England, however, Sorrel discovers not only a devastated garden, but also a broken man: the dashing Andrew Warburton, an Anglican priest whose faith in God and woman has fractured under the weight of a broken relationship. As love blossoms between Sorrel and Andrew, however, the garden’s curse looms darkly. A mysterious series of tapestries depicts a gruesome crime committed by one of the family’s patriarchs, and although several clues have been embroidered into the fabric, the final panel is missing, along with a diary kept by the patriarch’s long-suffering wife. As Sorrel delves into the soil, even more toxic secrets come to light—secrets that may endanger her life. 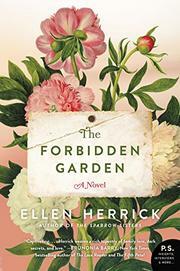 Herrick spins a charming tale, deftly marrying dark Gothic elements to bright romance. She even titles each chapter with the name of a plant in the Shakespeare Garden, using the language of flowers—from “primula,” presaging new love, to “willow” for mourning—to deepen her spell. Bewitching romance ripe for even more sequels.